I hope everyone enjoys this last day of the weekend. Tomorrow starts a new week... Meantime I want to show you an outfit that I wore last week. Bright accessories in a black/ grey ensemble. 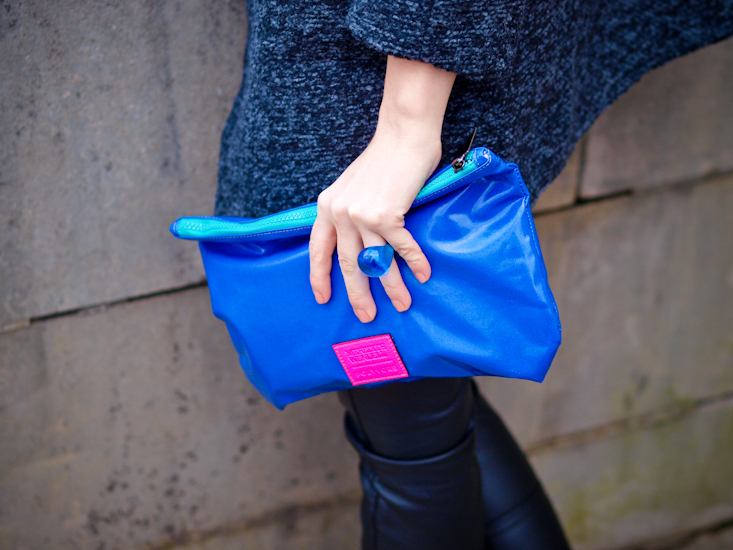 A special thanks to Polyvore and Meredith Wendell for this bold blue clutch that I received as a Christmas gift last month. I wish you all a wonderful and bright week! Such a cool, cozy outfit! 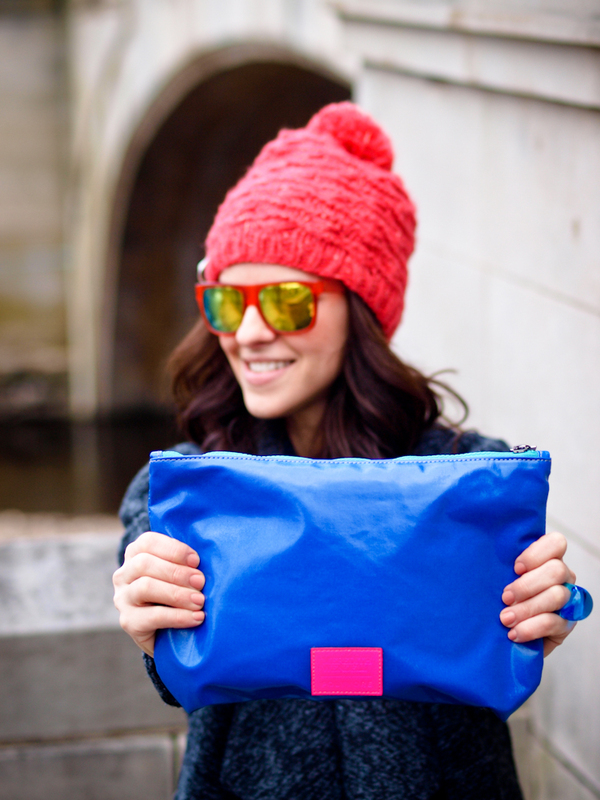 Love it all…and all the color is a plus!! I love the coat! this is truly a perfect outfit! I LOVE the clutch! The whole look rocks beauty! once again, I love colors on your pictures! nice coat! Love your coat, it’s amazing! And the leather pants work great for you. You look so cute,I love everything dear! You look so cute with the red hat! And this big cardigan is beautiful, it looks so warm and cozy! 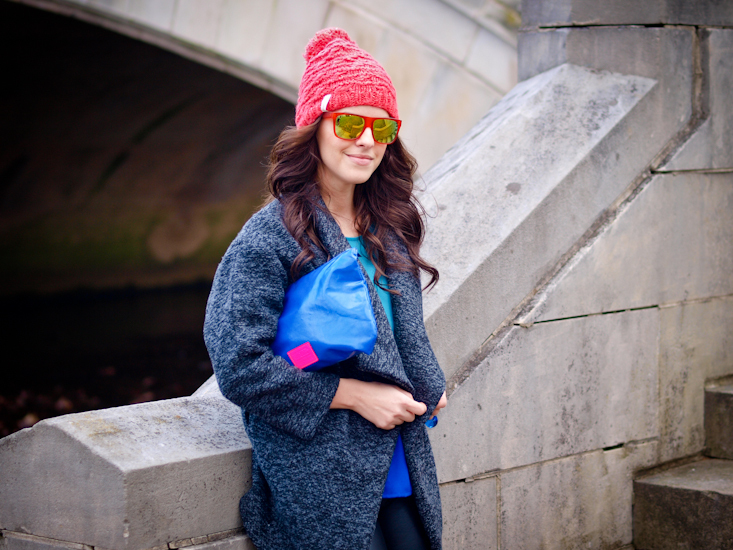 i love the bright beanie and sunglasses….such an unexpected twist!!!! I loved the glasses and the clutch! you are such a cutie pie !!! You’ve seriously got the most inspirational style, Veronica… so bold, yet effortless and chic! Love the way you’ve styled this and how you look non-fussy but still completely stylish. And your hair is amazing.. exactly what I’ve been wanting to achieve with mine! Tutorial please?? Such a great look Veronica! I love how you’ve added a pop of red through your hat. And the coat is truly fabulous! 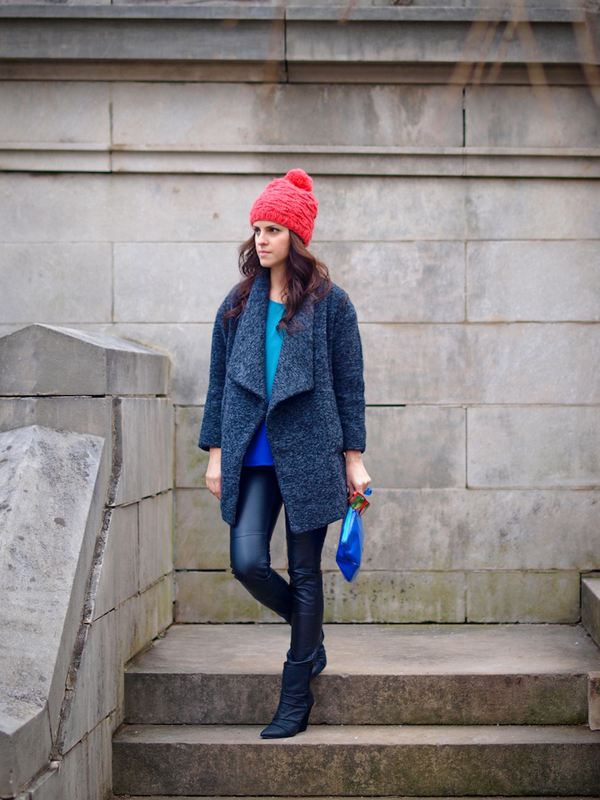 I LOVE this beanie and the pop of color it adds to the outfit. 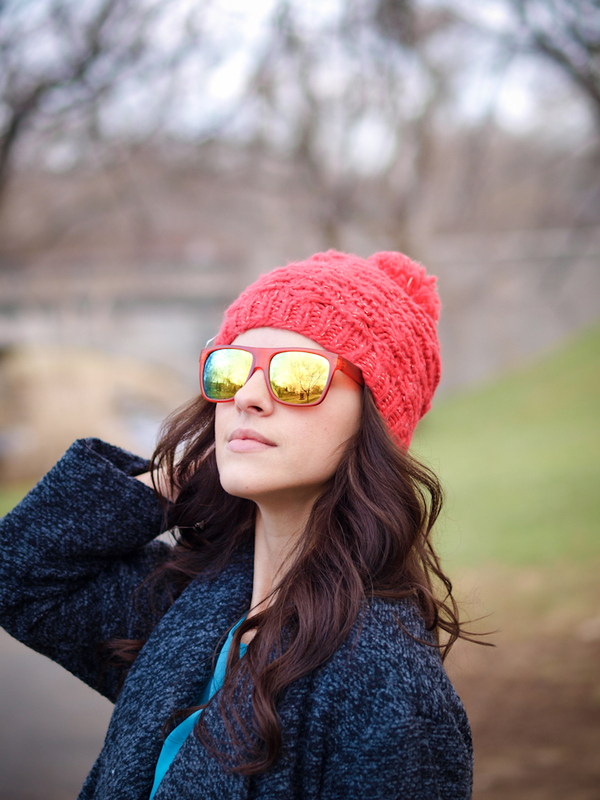 Knitted accessories are some of my favorite things to wear during the winter and even all year round if I can! The cardigan is so nice: stylish design and perfect colour! 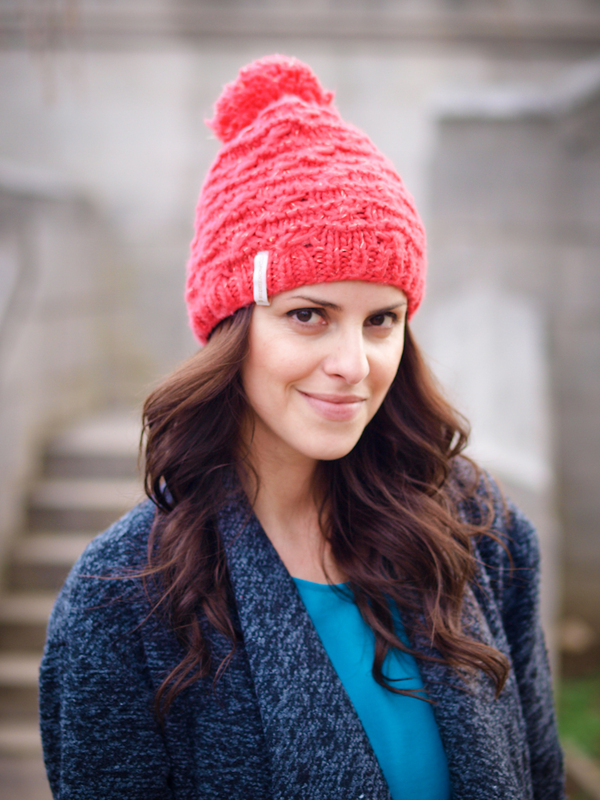 I’m a big fan of beanies and the pom-pom adds a playful touch! I really like everything about this outfit! love the beanie and the coat!! !so nice!kisses! Another magnificent look from you. The perfect winter silhouette. Effortless elegance with a dash of playful coloring!